A look into the industrial ruins and remains of a 19th century cypress lumber mill. 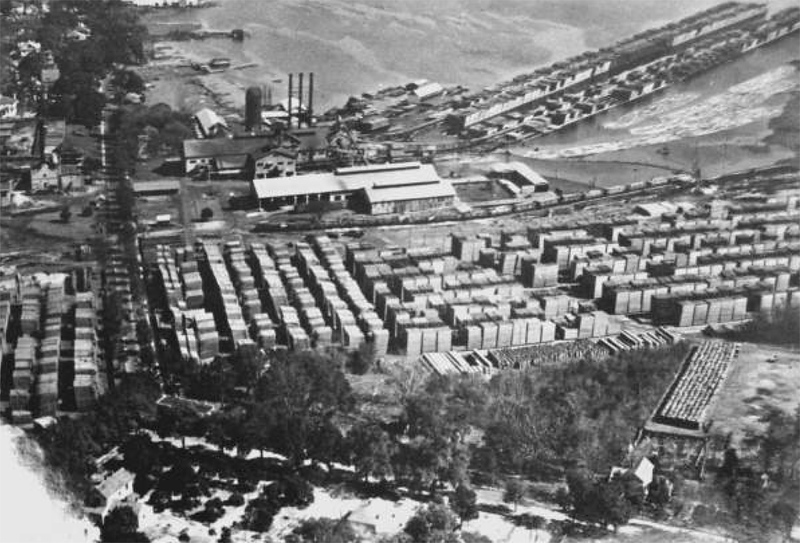 1940s aerial of the Wilson Cypress Company and Florida Furniture Industries. Courtesy of State Archives of Florida. 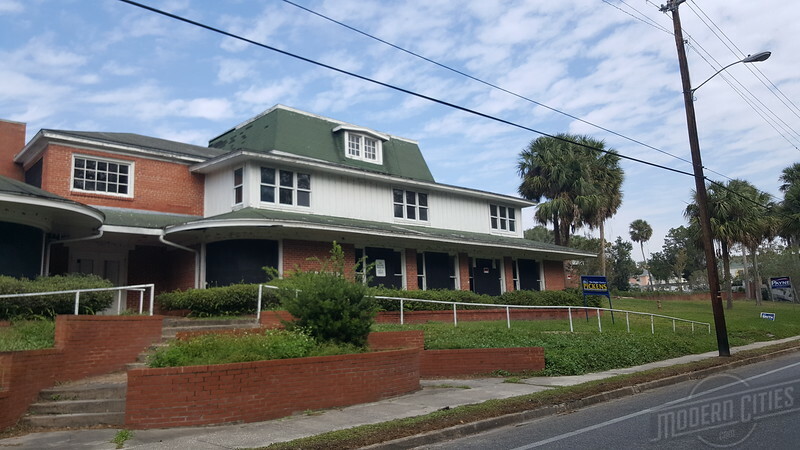 During the late 19th century, Palatka emerged as an important interior port along the St. Johns River. Much of its industrial activity was a result of the Wilson Cypress Company, which at its peak, was the second largest cypress mill in the world, producing 80,000 feet of lumber and 60,000 shingles daily. The company was established on October 15, 1891 as the Tilghman-Wilson Company when A.E. and H.S. Wilson of Saginaw, MI purchased the Noah J. Tilghman & Son sawmill. On April 3, 1895, the mill was changed to Wilson Cypress. At the company’s height, it owned more than 100,000 acres of original growth cypress across ten Florida counties that was harvested to feed its operations. 1915 Sanborn Map illustrating the location of Wilson Cypress Company and the Selden Cypress Door Company. As the largest producer of red-harvest tidewater cypress lumber in the world, the mill spawned other allied industries, the Davis Tank Factory and the Selden Cypress Door Company. Owned by G.M. Davis & Sons, Davis made cypress water tanks for the railroads until they converted to diesel. 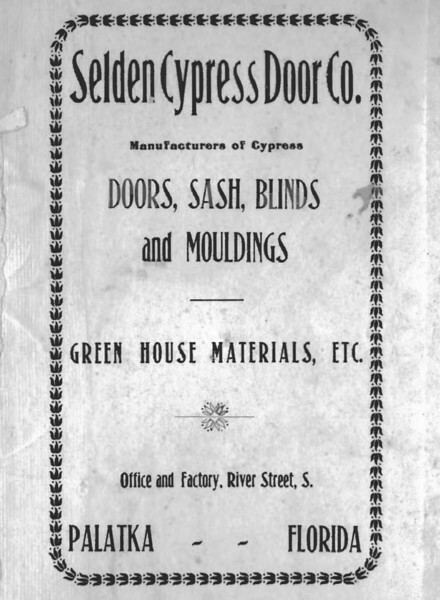 Located at 722 River Street, across the street from Wilson Cypress, the Selden Cypress Door Company was founded by George B. Selden in 1895. Two years later, the mill complex included a sash, door and blind factory, a planing mill, carpenter shop, door kiln and an elevated trestle tramway directly connected to the Wilson Cypress Company’s saw mill and lumber wharfs along the river. A railroad siding connecting the mill to the Jacksonville, Tampa & Key West Railroad entered the complex from the north. By 1910, Selden employed 230 workers. 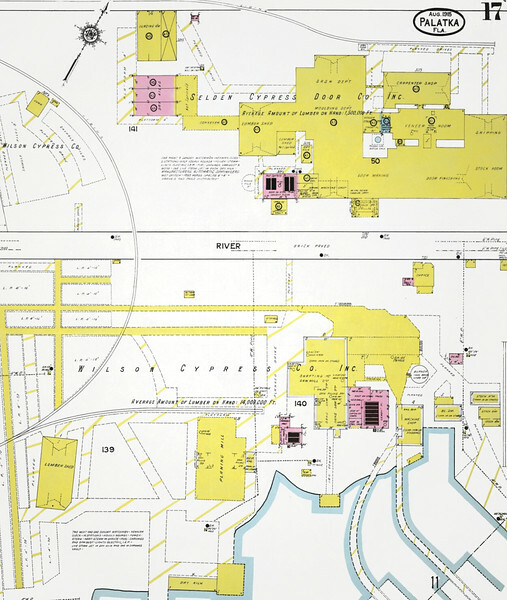 In 1930, Howard L. Gardner, Fount H. Rion, Sr., and Charles M. Tanner took over Selden, establishing the facility as Florida Furniture Industries, Inc. Here, they produced cypress wood products such as park benches and porch swings. They also expanded their product mix to include bedroom sets. Despite Wilson Cypress shutting down in 1944, Florida Furniture Industries, Inc. continued to grow. At its peak it employed 650, producing 2,000 bedrooms sets each week to supply 4,000 retail stores in 40 states across the country. Ultimately, business fell into decline during the 1990’s as foreign competitors took over the market by being to offer similar products at a cheaper cost due to cheaper labor costs. On December 13, 2002, after 107 years in operation, the company closed the mill two days after losing a federal bankruptcy court case, leaving 200 employees without jobs. 15 years after its closure, these industrial ruins are all that’s left of what was once a massive manufacturing complex built during Florida’s days as a major logging and lumber epicenter.